Jolly Dancing Bear Screensaver, Free-Games-Island.com has released new advanced version of great 3d free picturesque Screen Saver Jolly Dancing Bear. The polar bear appears on the drifting ice-floe but he has some stock stolen from careless geologists. So he has a nice rest and relaxes listening to the music (in this version you can listen to it too), sometimes he starts to dance (fantastic animation! ), sometimes the beer comes to the end. ...... ), sometimes the beer comes to the end and cunning cute pet asks you to buy him more. If you cannot refuse him - go to our web site shop and buy a box of beer, he will be so grateful! 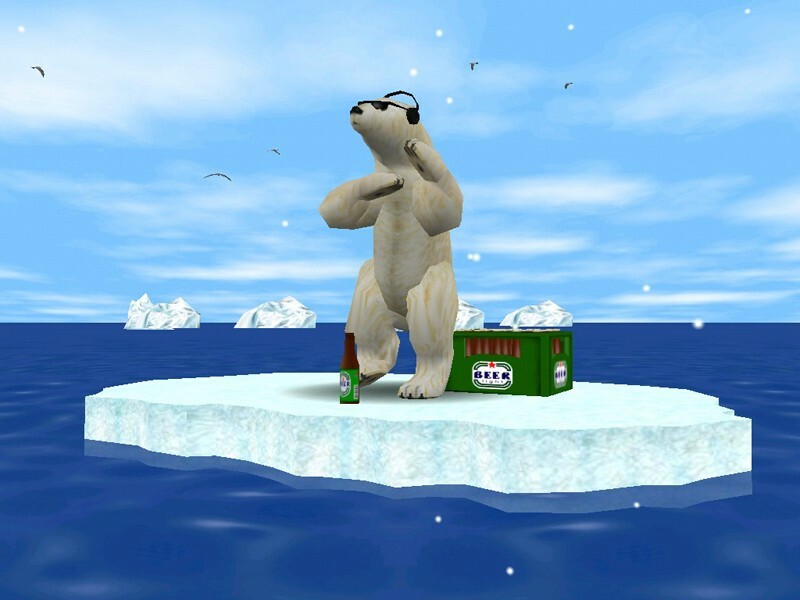 Beer makes the polar bear to dance and feel cool! We have a report how your favorite 3D Arctic bear celebrated. Fly your spirits high in the sky with these free and happy creatures! Qweas is providing links to Jolly Dancing Bear Screensaver 1.0 as a courtesy, and makes no representations regarding Jolly Dancing Bear Screensaver or any other applications or any information related thereto. Any questions, complaints or claims regarding this application Jolly Dancing Bear Screensaver 1.0 must be directed to the appropriate software vendor. You may click the publisher link of Jolly Dancing Bear Screensaver on the top of this page to get more details about the vendor.